Enter your website Domain name click on Create Free SSL Certificate. 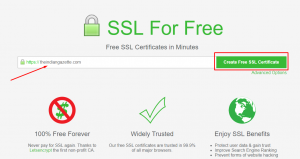 Fill out the following details to verify the domain and generate free SSL Certificate. Type: Select SFTP from the dropdown list. Port: Enter your SFTP Port number. By default for SFTP it is 22, If you have changed your SFTP Port, enter your valid port number. Password: Enter the password for root user. After filling out the form click on “Download Free SSL Certificate“. Your SSL Certificate is successfully generated. 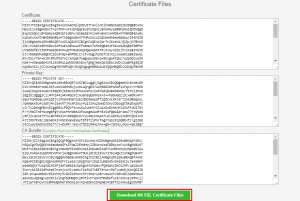 Download and Save your Certificate files by clicking on “Download All SSL Certificate Files“. Now you can add this above-generated SSL certificate to your domain. To Enable SSL from SetupServer.io go see our documentation – Enable SSL from SetupServer.io and go to Custom SSL section and follow the steps.